The Mercator projection with Tissot's indicatrix of deformation. Mercator 1569 world map (Nova et Aucta Orbis Terrae Descriptio ad Usum Navigantium Emendate Accommodata) showing latitudes 66°S to 80°N. Mercator's 1569 edition was a large planisphere measuring 202 by 124 cm (80 by 49 in), printed in eighteen separate sheets. As in all cylindrical projections, parallels and meridians are straight and perpendicular to each other. In accomplishing this, the unavoidable east-west stretching of the map, which increases as distance away from the equator increases, is accompanied in the Mercator projection by a corresponding north-south stretching, so that at every point location the east-west scale is the same as the north-south scale, making it a conformal map projection. Conformal projections preserve angles around all locations. Because the linear scale of a Mercator map increases with latitude, it distorts the size of geographical objects far from the equator and conveys a distorted perception of the overall geometry of the planet. At latitudes greater than 70° north or south the Mercator projection is practically unusable, because the linear scale becomes infinitely large at the poles. A Mercator map can therefore never fully show the polar areas (as long as the projection is based on a cylinder centered on the Earth's rotation axis; see the transverse Mercator projection for another application). All lines of constant bearing (rhumbs or loxodromes—those making constant angles with the meridians) are represented by straight segments on a Mercator map. The two properties, conformality and straight rhumb lines, make this projection uniquely suited to marine navigation: courses and bearings are measured using wind roses or protractors, and the corresponding directions are easily transferred from point to point, on the map, with the help of a parallel ruler (for example). The name and explanations given by Mercator to his world map (Nova et Aucta Orbis Terrae Descriptio ad Usum Navigantium Emendata: "new and augmented description of Earth corrected for the use of sailors") show that it was expressly conceived for the use of marine navigation. Although the method of construction is not explained by the author, Mercator probably used a graphical method, transferring some rhumb lines previously plotted on a globe to a square graticule (grid formed by lines of latitude and longitude), and then adjusting the spacing between parallels so that those lines became straight, making the same angle with the meridians as in the globe. German Erhard Etzlaub (c. 1460–1532), who had engraved miniature "compass maps" (about 10×8 cm) of Europe and parts of Africa, latitudes 67°–0°, to allow adjustment of his portable pocket-size sundials, was for decades declared to have designed "a projection identical to Mercator's". Portuguese mathematician and cosmographer Pedro Nunes (1502–1578), who first described the loxodrome and its use in marine navigation, and suggested the construction of a nautical atlas composed of several large-scale sheets in the cylindrical equidistant projection as a way to minimize distortion of directions. If these sheets were brought to the same scale and assembled an approximation of the Mercator projection would be obtained (1537). English mathematician Edward Wright (c. 1558–1615), who published accurate tables for its construction (1599, 1610). English mathematicians Thomas Harriot (1560–1621) and Henry Bond (c.1600–1678) who, independently (c.1600 and 1645), associated the Mercator projection with its modern logarithmic formula, later deduced by calculus. The Mercator projection portrays Greenland as larger than Australia; in actuality, Australia is more than three and a half times as large as Greenland. Greenland appears larger than Africa, when in reality Africa's area is 14 times greater and Greenland's is comparable to Algeria's alone. Africa also appears to be roughly the same size as Europe, when in reality Africa is nearly 3 times larger. Alaska takes as much area on the map as Brazil, when Brazil's area is nearly five times that of Alaska. Finland appears with a greater north-south extent than India, although India's is greater. Antarctica appears as the biggest continent (and would be infinitely large on a complete map), although it is actually the fifth in area. A relation between the Mercator projection and the true size of each country. The Mercator projection is still used commonly for navigation. On the other hand, because of great land area distortions, it is not well suited for general world maps. Therefore, Mercator himself used the equal-area sinusoidal projection to show relative areas. However, despite such distortions, Mercator projection was, especially in the late 19th and early 20th centuries, perhaps the most common projection used in world maps, despite being much criticized for this use. Because of its very common usage, it has been supposed to have influenced on people's view of the world, and because it shows countries near the Equator as too small when compared to those of Europe and North America, it has been supposed to cause people to consider those countries as less important. As a result of these criticisms, most modern atlases no longer use the Mercator projection for world maps or for areas distant from the equator, preferring other cylindrical projections, or forms of equal-area projection. The Mercator projection is still commonly used for areas near the equator, however, where distortion is minimal. Arno Peters stirred controversy when he proposed what is now usually called the Gall–Peters projection as the alternative to the Mercator. The projection he promoted is a specific parameterization of the cylindrical equal-area projection. In response, a 1989 resolution by seven North American geographical groups deprecated the use of cylindrical projections for general purpose world maps, which would include both the Mercator and the Gall–Peters. Many major online street mapping services (Bing Maps, OpenStreetMap, Google Maps, MapQuest, Yahoo! Maps, and others) use a variant of the Mercator projection for their map images called Web Mercator or Google Web Mercator. Despite its obvious scale variation at small scales, the projection is well-suited as an interactive world map that can be zoomed seamlessly to large-scale (local) maps, where there is relatively little distortion due to the variant projection's near-conformality. The major online street mapping services tiling systems display most of the world at the lowest zoom level as a single square image, excluding the polar regions by truncation at latitudes of φmax = ±85.05113°. (See below.) Latitude values outside this range are mapped using a different relationship that doesn't diverge at φ = ±90°. Although the surface of Earth is best modelled by an oblate ellipsoid of revolution, for small scale maps the ellipsoid is approximated by a sphere of radius a. Many different methods exist for calculating a. The simplest include (a) the equatorial radius of the ellipsoid, (b) the arithmetic or geometric mean of the semi-axes of the ellipsoid, (c) the radius of the sphere having the same volume as the ellipsoid. The range of all possible choices is about 35 km, but for small scale (large region) applications the variation may be ignored, and mean values of 6,371 km and 40,030 km may be taken for the radius and circumference respectively. These are the values used for numerical examples in later sections. Only high-accuracy cartography on large scale maps requires an ellipsoidal model. The spherical approximation of Earth with radius a can be modelled by a smaller sphere of radius R, called the globe in this section. The globe determines the scale of the map. The various cylindrical projections specify how the geographic detail is transferred from the globe to a cylinder tangential to it at the equator. The cylinder is then unrolled to give the planar map. The fraction R/a is called the representative fraction (RF) or the principal scale of the projection. For example, a Mercator map printed in a book might have an equatorial width of 13.4 cm corresponding to a globe radius of 2.13 cm and an RF of approximately 1/300M (M is used as an abbreviation for 1,000,000 in writing an RF) whereas Mercator's original 1569 map has a width of 198 cm corresponding to a globe radius of 31.5 cm and an RF of about 1/20M. A cylindrical map projection is specified by formulae linking the geographic coordinates of latitude φ and longitude λ to Cartesian coordinates on the map with origin on the equator and x-axis along the equator. By construction, all points on the same meridian lie on the same generator of the cylinder at a constant value of x, but the distance y along the generator (measured from the equator) is an arbitrary function of latitude, y(φ). In general this function does not describe the geometrical projection (as of light rays onto a screen) from the centre of the globe to the cylinder, which is only one of an unlimited number of ways to conceptually project a cylindrical map. Since the cylinder is tangential to the globe at the equator, the scale factor between globe and cylinder is unity on the equator but nowhere else. In particular since the radius of a parallel, or circle of latitude, is R cos φ, the corresponding parallel on the map must have been stretched by a factor of 1/cos φ = sec φ. This scale factor on the parallel is conventionally denoted by k and the corresponding scale factor on the meridian is denoted by h.
The relations between y(φ) and properties of the projection, such as the transformation of angles and the variation in scale, follow from the geometry of corresponding small elements on the globe and map. The figure below shows a point P at latitude φ and longitude λ on the globe and a nearby point Q at latitude φ + δφ and longitude λ + δλ. The vertical lines PK and MQ are arcs of meridians of length Rδφ. The horizontal lines PM and KQ are arcs of parallels of length R(cos φ)δλ. The corresponding points on the projection define a rectangle of width δx and height δy. Equality of angles. The condition that a sailing course of constant azimuth α on the globe is mapped into a constant grid bearing β on the map. Setting α = β in the above equations gives y ′(φ) = R sec φ.
Isotropy of scale factors. This is the statement that the point scale factor is independent of direction so that small shapes are preserved by the projection. Setting h = k in the above equations again gives y ′(φ) = R sec φ. In the first equation λ0 is the longitude of an arbitrary central meridian usually, but not always, that of Greenwich (i.e., zero). The difference (λ − λ0) is in radians. The expression on the right of the second equation defines the Gudermannian function; i.e., φ = gd(y/R): the direct equation may therefore be written as y = R·gd−1(φ). There are many alternative expressions for y(φ), all derived by elementary manipulations. The ordinate y of the Mercator projection becomes infinite at the poles and the map must be truncated at some latitude less than ninety degrees. This need not be done symmetrically. Mercator's original map is truncated at 80°N and 66°S with the result that European countries were moved towards the centre of the map. The aspect ratio of his map is 198/120 = 1.65. Even more extreme truncations have been used: a Finnish school atlas was truncated at approximately 76°N and 56°S, an aspect ratio of 1.97. This result holds for an arbitrary direction: the definition of isotropy of the point scale factor. The graph shows the variation of the scale factor with latitude. Some numerical values are listed below. The variation with latitude is sometimes indicated by multiple bar scales as shown below and, for example, on a Finnish school atlas. The interpretation of such bar scales is non-trivial. See the discussion on distance formulae below. The area scale factor is the product of the parallel and meridian scales hk = sec2φ. For Greenland, taking 73° as a median latitude, hk = 11.7. For Australia, taking 25° as a median latitude, hk = 1.2. For Great Britain, taking 55° as a median latitude, hk = 3.04. The classic way of showing the distortion inherent in a projection is to use Tissot's indicatrix. Nicolas Tissot noted that the scale factors at a point on a map projection, specified by the numbers h and k, define an ellipse at that point. For cylindrical projections, the axes of the ellipse are aligned to the meridians and parallels. For the Mercator projection, h = k, so the ellipses degenerate into circles with radius proportional to the value of the scale factor for that latitude. These circles are rendered on the projected map with extreme variation in size, indicative of Mercator's scale variations. One measure of a map's accuracy is a comparison of the length of corresponding line elements on the map and globe. Therefore, by construction, the Mercator projection is perfectly accurate, k = 1, along the equator and nowhere else. At a latitude of ±25° the value of sec φ is about 1.1 and therefore the projection may be deemed accurate to within 10% in a strip of width 50° centred on the equator. Narrower strips are better: sec 8° = 1.01, so a strip of width 16° (centred on the equator) is accurate to within 1% or 1 part in 100. Similarly sec 2.56° = 1.001, so a strip of width 5.12° (centred on the equator) is accurate to within 0.1% or 1 part in 1,000. Therefore, the Mercator projection is adequate for mapping countries close to the equator. 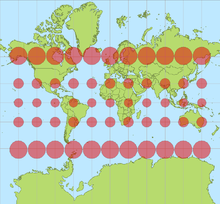 In a secant (in the sense of cutting) Mercator projection the globe is projected to a cylinder which cuts the sphere at two parallels with latitudes ±φ1. The scale is now true at these latitudes whereas parallels between these latitudes are contracted by the projection and their scale factor must be less than one. The result is that deviation of the scale from unity is reduced over a wider range of latitudes. 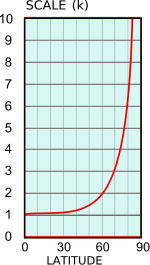 The scale on the equator is 0.99; the scale is k = 1 at a latitude of approximately ±8° (the value of φ1); the scale is k = 1.01 at a latitude of approximately ±11.4°. Therefore, the projection has an accuracy of 1%, over a wider strip of 22° compared with the 16° of the normal (tangent) projection. This is a standard technique of extending the region over which a map projection has a given accuracy. The scale factor is unity on the equator, as it must be since the cylinder is tangential to the ellipsoid at the equator. The ellipsoidal correction of the scale factor increases with latitude but it is never greater than e2, a correction of less than 1%. (The value of e2 is about 0.006 for all reference ellipsoids.) This is much smaller than the scale inaccuracy, except very close to the equator. Only accurate Mercator projections of regions near the equator will necessitate the ellipsoidal corrections. Converting ruler distance on the Mercator map into true (great circle) distance on the sphere is straightforward along the equator but nowhere else. One problem is the variation of scale with latitude, and another is that straight lines on the map (rhumb lines), other than the meridians or the equator, do not correspond to great circles. The distinction between rhumb (sailing) distance and great circle (true) distance was clearly understood by Mercator. (See Legend 12 on the 1569 map.) He stressed that the rhumb line distance is an acceptable approximation for true great circle distance for courses of short or moderate distance, particularly at lower latitudes. He even quantifies his statement: "When the great circle distances which are to be measured in the vicinity of the equator do not exceed 20 degrees of a great circle, or 15 degrees near Spain and France, or 8 and even 10 degrees in northern parts it is convenient to use rhumb line distances". With radius and great circle circumference equal to 6,371 km and 40,030 km respectively an RF of 1/300M, for which R = 2.12 cm and W = 13.34 cm, implies that a ruler measurement of 3 mm. in any direction from a point on the equator corresponds to approximately 900 km. The corresponding distances for latitudes 20°, 40°, 60° and 80° are 846 km, 689 km, 450 km and 156 km respectively. Longer distances require various approaches. For the above model, with RF = 1/300M, 1 cm corresponds to 3,000 km. Parallel distance = ruler distance × cos φ / RF (parallel). For the above model 1 cm corresponds to 1,500 km at a latitude of 60°. This is not the shortest distance between the chosen endpoints on the parallel because a parallel is not a great circle. The difference is small for short distances but increases as λ, the longitudinal separation, increases. For two points, A and B, separated by 10° of longitude on the parallel at 60° the distance along the parallel is approximately 0.5 km greater than the great circle distance. (The distance AB along the parallel is (a cos φ) λ. The length of the chord AB is 2(a cos φ) sin λ/2. This chord subtends an angle at the centre equal to 2arcsin(cos φ sin λ/2) and the great circle distance between A and B is 2a arcsin(cos φ sin λ/2).) In the extreme case where the longitudinal separation is 180°, the distance along the parallel is one half of the circumference of that parallel; i.e., 10,007.5 km. On the other hand, the geodesic between these points is a great circle arc through the pole subtending an angle of 60° at the center: the length of this arc is one sixth of the great circle circumference, about 6,672 km. The difference is 3,338 km so the ruler distance measured from the map is quite misleading even after correcting for the latitude variation of the scale factor. where R may be calculated from the width W of the map by R = W/2π. For example, on a map with R = 1 the values of y = 0, 1, 2, 3 correspond to latitudes of φ = 0°, 50°, 75°, 84° and therefore the successive intervals of 1 cm on the map correspond to latitude intervals on the globe of 50°, 25°, 9° and distances of 5,560 km, 2,780 km, and 1,000 km on the Earth. A straight line on the Mercator map at angle α to the meridians is a rhumb line. When α = π/2 or 3π/2 the rhumb corresponds to one of the parallels; only one, the equator, is a great circle. 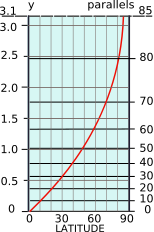 When α = 0 or π it corresponds to a meridian great circle (if continued around the Earth). For all other values it is a spiral from pole to pole on the globe intersecting all meridians at the same angle, and is thus not a great circle. This section discusses only the last of these cases. These formulæ give rhumb distances on the sphere which may differ greatly from true distances whose determination requires more sophisticated calculations. ^ Kellaway, G.P. (1946). Map Projections p. 37–38. London: Methuen & Co. LTD. (According to this source, it had been claimed that the Mercator projection was used for "imperialistic motives"
^ Abelson, C.E. (1954). Common Map Projections s. 4. Sevenoaks: W.H. Smith & Sons. ^ Chamberlin, Wellman (1947). The Round Earth on Flat Paper s. 99. Washington, D.C.: The National Geographic Society. ^ Fisher, Irving (1943). "A World Map on a Regular Icosahedron by Gnomonic Projection." Geographical Review 33 (4): 605. ^ "Mercator Projection vs. Peters Projection, part 2". Matt T. Rosenberg, about.com. ^ "Mercator Projection vs. Peters Projection, part 1". Matt T. Rosenberg, about.com. ^ American Cartographer. 1989. 16(3): 222–223. ^ "Google Groups". groups.google.com. Retrieved 30 April 2018. ^ Snyder, Working manual pp 37—95. ^ Snyder, Flattening the Earth. ^ A generator of a cylinder is a straight line on the surface parallel to the axis of the cylinder. ^ The function y(φ) is not completely arbitrary: it must be monotonic increasing and antisymmetric (y(−φ) = −y(φ), so that y(0)=0): it is normally continuous with a continuous first derivative. ^ a b Snyder. Working Manual, page 20. ^ R is the radius of the globe and φ is measured in radians. ^ λ is measured in radians. ^ a b c Osborne Chapter 2. ^ More general example of Tissot's indicatrix: the Winkel tripel projection. ^ See great-circle distance, the Vincenty's formulae, or Mathworld. Maling, Derek Hylton (1992), Coordinate Systems and Map Projections (second ed. ), Pergamon Press, ISBN 0-08-037233-3 . 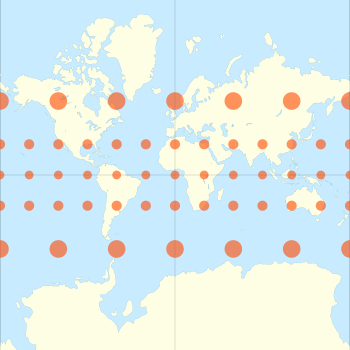 Wikimedia Commons has media related to Mercator projections. 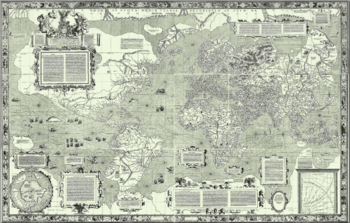 Ad maiorem Gerardi Mercatoris gloriam – contains high-resolution images of the 1569 world map by Mercator.